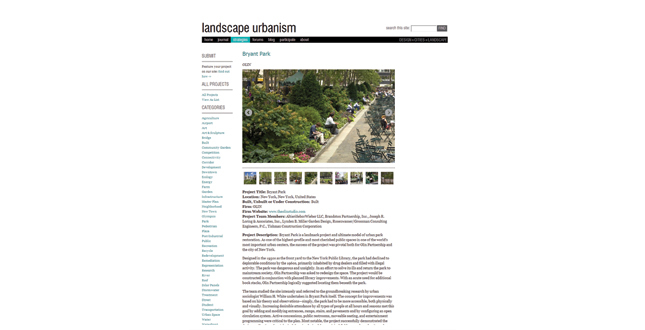 Landscape Urbanism Website. Wtructure and Components. 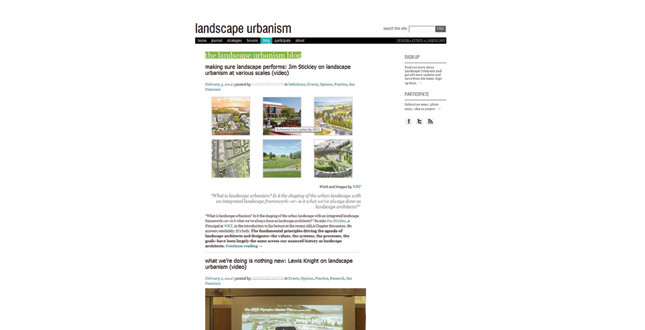 Landscape Urbanism Journal. Issue one, “indeterminacy and multiplicity” looks at practice, theory and definitions. 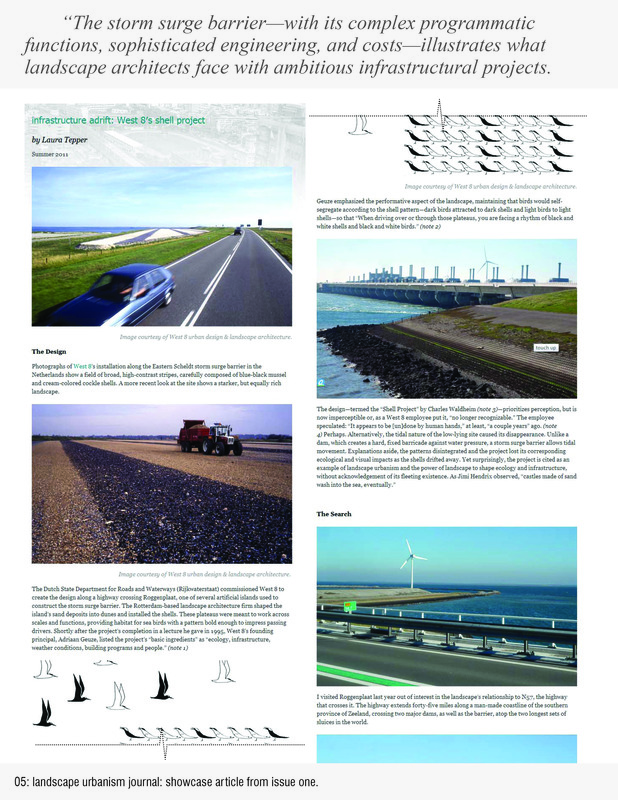 Landscape Urbanism Journal. 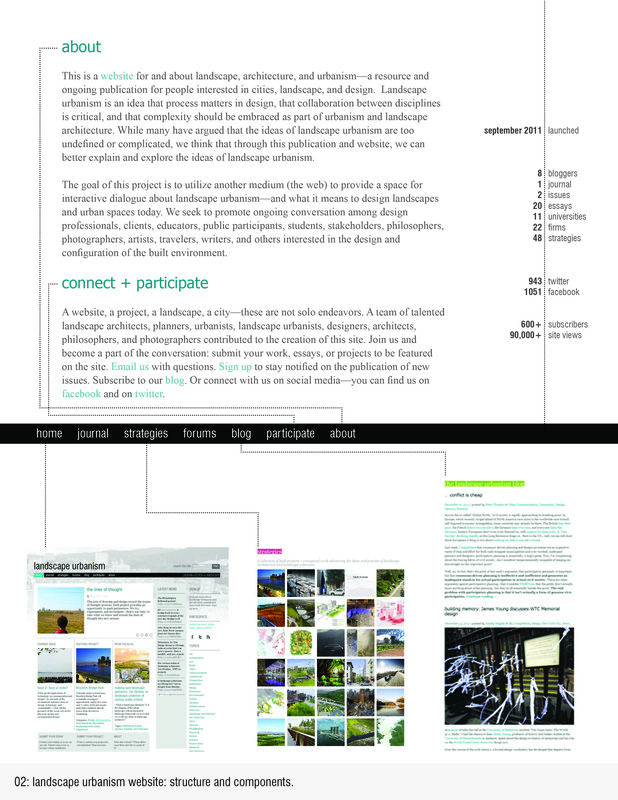 Issue two, “buzz or noise?” looks at communication and media in landscape architecture. 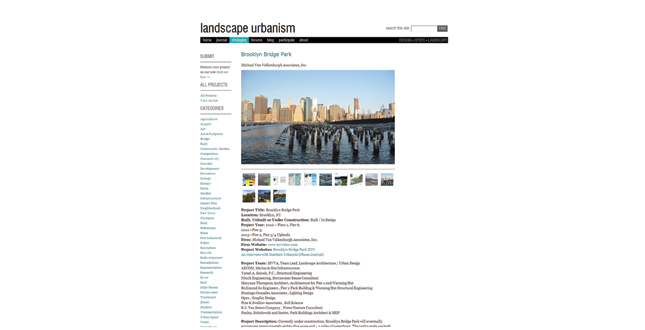 Landscape Urbanism Journal. Showcase article from issue one. Strategies. 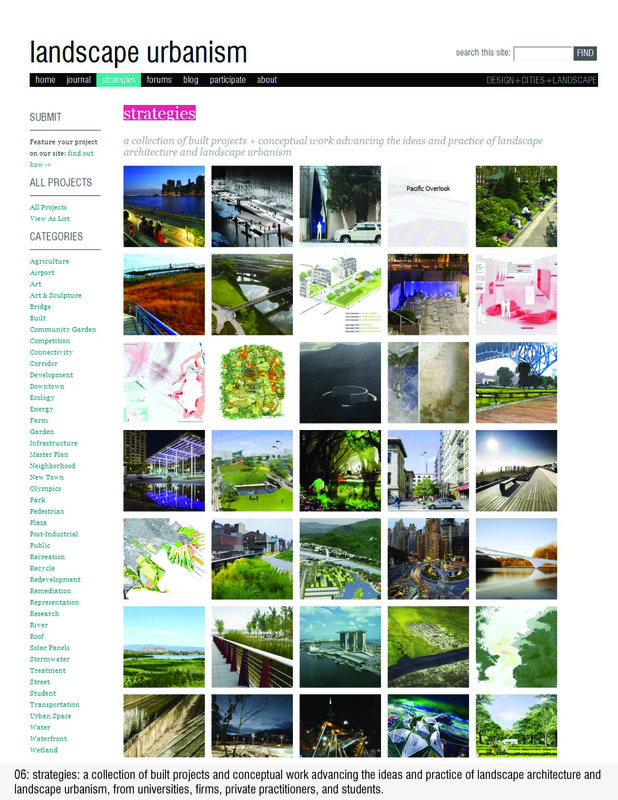 A collection of built projects and conceptual work advancing the ideas and practice of landscape architecture and landscape urbanism, from universities, firms, private practitioners, and students. Strategies. 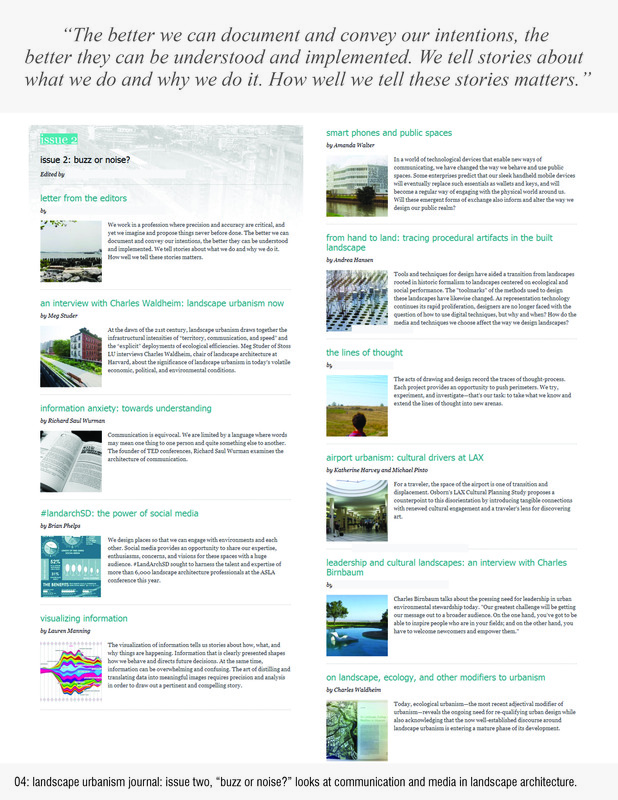 A sample layout of the details for each project included in the “strategies” section of the website. Strategies. 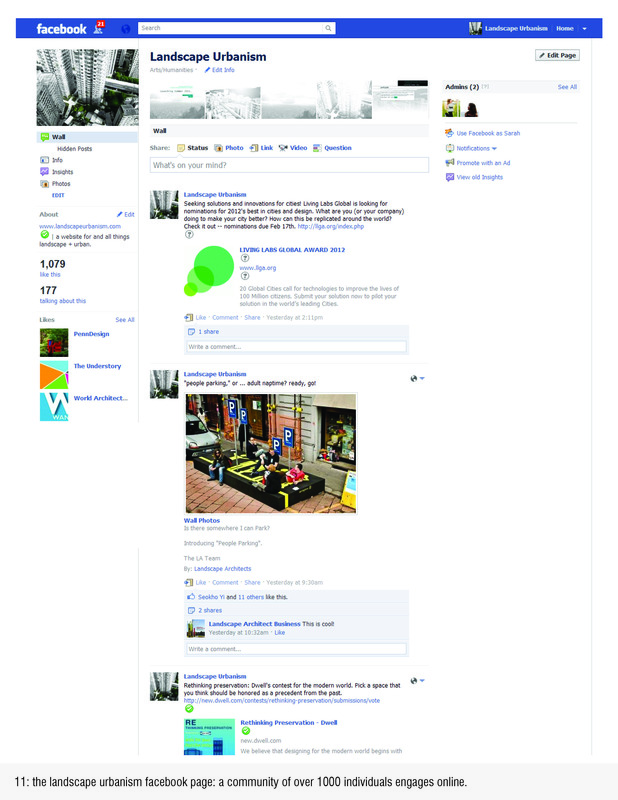 A second sample layout. 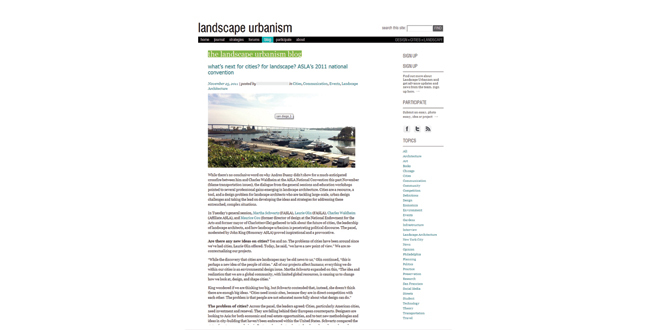 The Landscape Urbanism Blog. A collection of writers update the blog weekly with essays, news, and ideas. 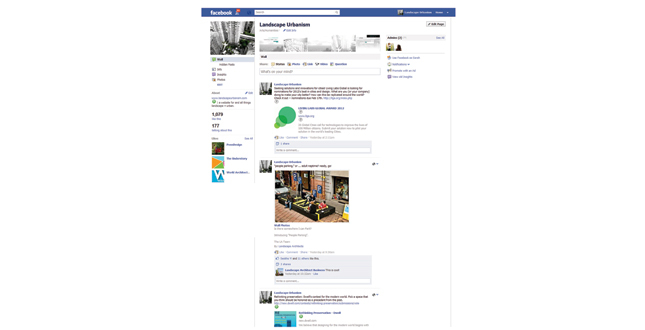 The Landscape Urbanism Facebook Page. A community of over 1000 individuals engages online. 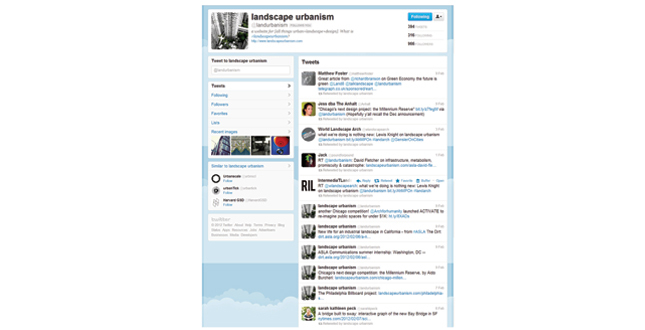 The Landscape Urbanism Twitter Page. 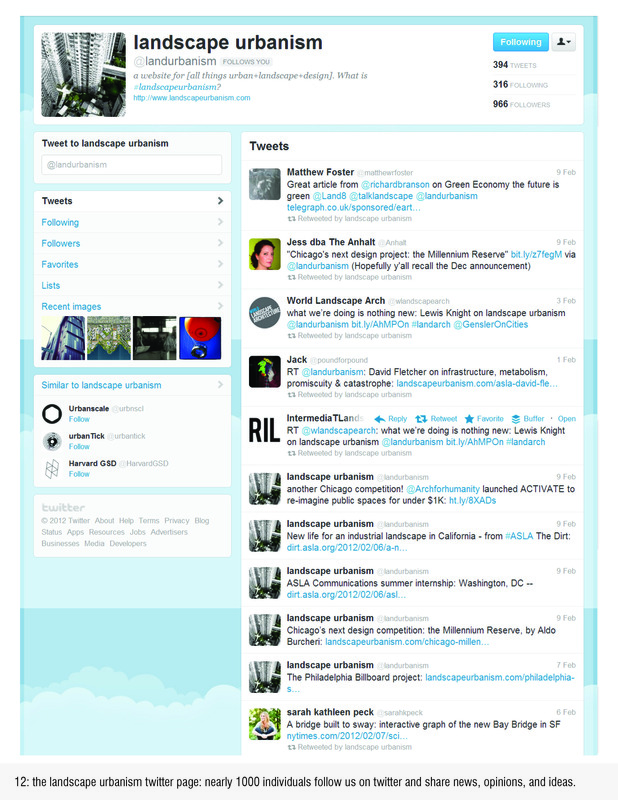 Nearly 1000 individuals follow us on twitter and share news, opinions, and ideas. 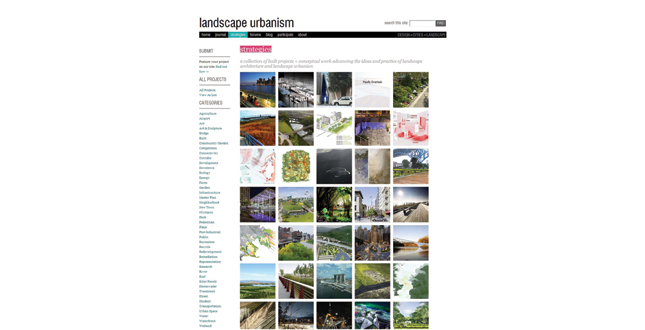 The Landscape Urbanism website provides a digital platform for interactive dialogue, research and engagement about the design of landscape and urban spaces today. Since launching in the fall of 2011, the website received 87,836 page views and grew to include a community of over 2000 followers on two social networks. This overwhelming response to the site indicates the need for a space to address the creative and generative role of landscape in shaping great cities. 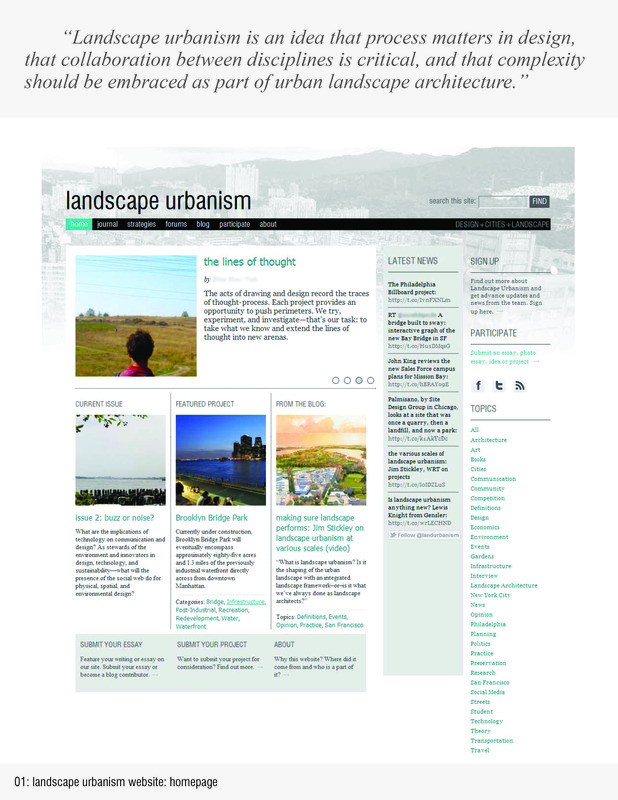 The Landscape Urbanism website is a resource and forum for people interested in cities, landscape and design. The goal of the site is to provide a platform for students, academics, practitioners and enthusiasts to participate in the ongoing dialogue around landscape urbanism and the design, culture and technology of cities. 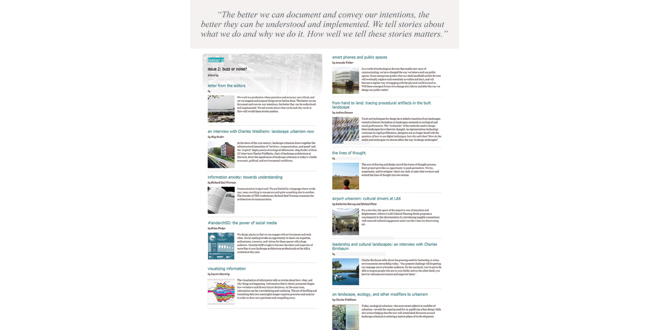 The website is comprised of three main sections: a quarterly online journal, “strategies” — a visual library of projects — and an ongoing news blog. At the turn of this century, the Internet changed our access to and exchange of data. The Internet also is changing our expectations and modes of production for publishing, drawing, drafting and design in all fields including landscape. At the same time, we notice that landscape architecture struggles for recognition and often works behind-the-scenes to create the stage upon which everyday life is built. And today, everyday life is built in cities where more people live than ever before. 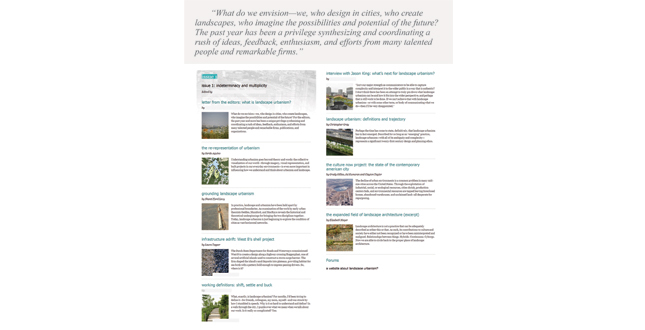 With the malleability and accessibility of a digital medium, we sought to create a platform to host and garner a range of perspectives, insights and arguments on the design of cities and landscape from and for a wide audience. How do we talk about what we do? How do we tell the story of landscape architecture beyond our profession? 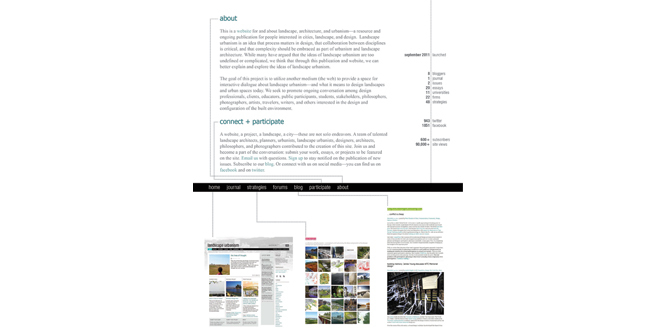 How do we share the stories of urban life and dynamics, of landscape ecologies, and of design? How do we reach the people who use these environments most? 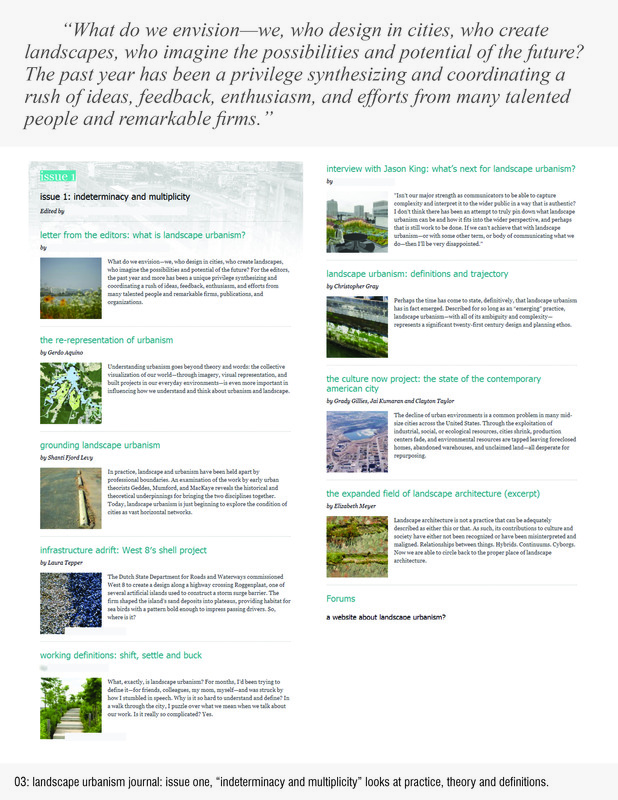 These questions were the start of a conversation among a few young designers who built the Landscape Urbanism website. Originally, this work started as a graduate research project. Several years later, a firm’s four-week fellowship provided the time and seed-money to build an initial platform. 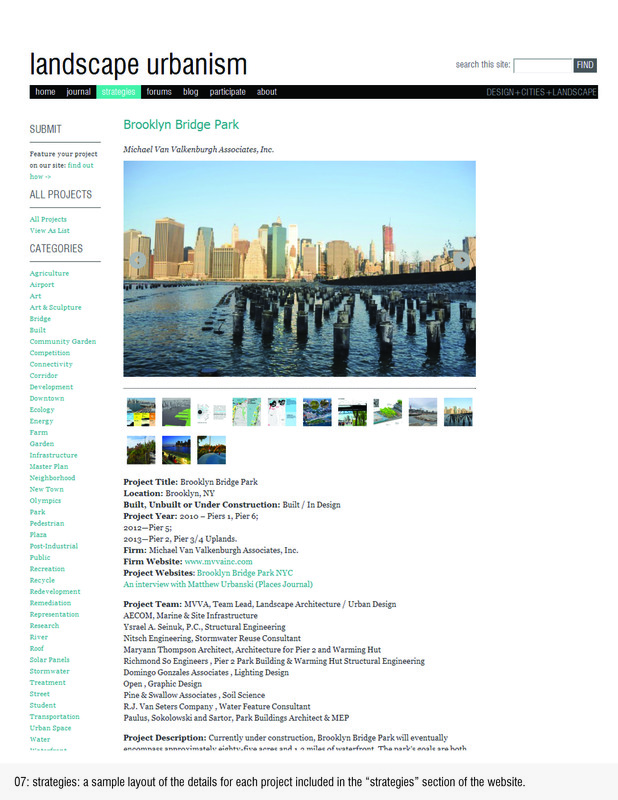 However, the website quickly grew and gained momentum, becoming the collaboration of a talented and committed team of landscape architects, planners, urbanists, landscape urbanists, designers, architects, writers, and photographers who continue to build, deepen and expand the site. Over the past year, with the concerted efforts of a core group of editors and writers, more than twenty authors and thirty firms and universities are represented on the site through articles, projects and blog posts. At the time of this writing, thirty-five projects are featured in “strategies” and more are submitted to us and uploaded every week. Landscape urbanism is a mode of thinking about the design and functioning of cities that uses landscape as the lens by which cities are both understood and shaped. Landscape urbanism posits a process of city building that places landscape architecture as the formative step in urban development rather than the last, and says that landscape architecture’s role lies as much in the design and planning of transportation and habitat corridors, stormwater and sewage treatment infrastructure, remediation of post-industrial toxic lands, and long-term real estate processes, as in the design and construction of traditional parks and gardens. 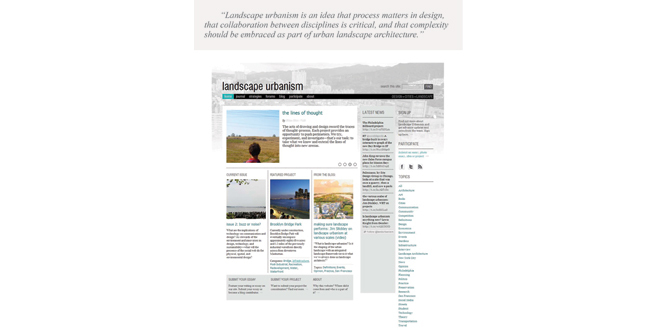 Landscape urbanism expands the scope of landscape architecture’s inquiry and intervention. It tackles the intersection of design, policy and ecological planning in an inclusive effort to make better urban environments, across disciplinary boundaries. If landscape architecture is one of the last generalist professions, we cannot see a more comprehensive approach to the design of cities and human landscapes than that of landscape urbanism. Since launching in September of 2011, we have published two issues of the online journal, we are editing a third, and future issues are in development phases. Issue one, Indeterminacy and Multiplicity, introduces seminal figures and ideas of landscape urbanism, building on the dialogue of the last two decades while offering alternative views and definitions. Issue two, Buzz or Noise? looks at the role of communication and why narrative is an important tool for landscape architects. 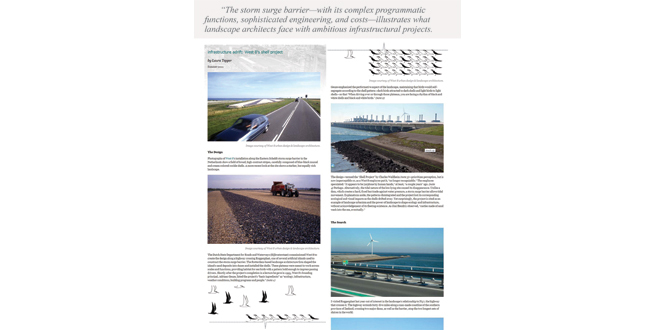 Issue three, Performance and Process, addresses the performance of landscapes and how to quantify the impact of our built work. Within the first month alone, the site reached 20,000 views and today receives an average of 7,500 hits a month. The project team also runs a Facebook page and Twitter feed to connect, converse and exchange news and ideas with a growing community. Since the site’s launch, 1060 individuals have joined the Facebook page, 925 follow the Twitter feed, and just over 600 people subscribed to the blog — and the numbers are growing. 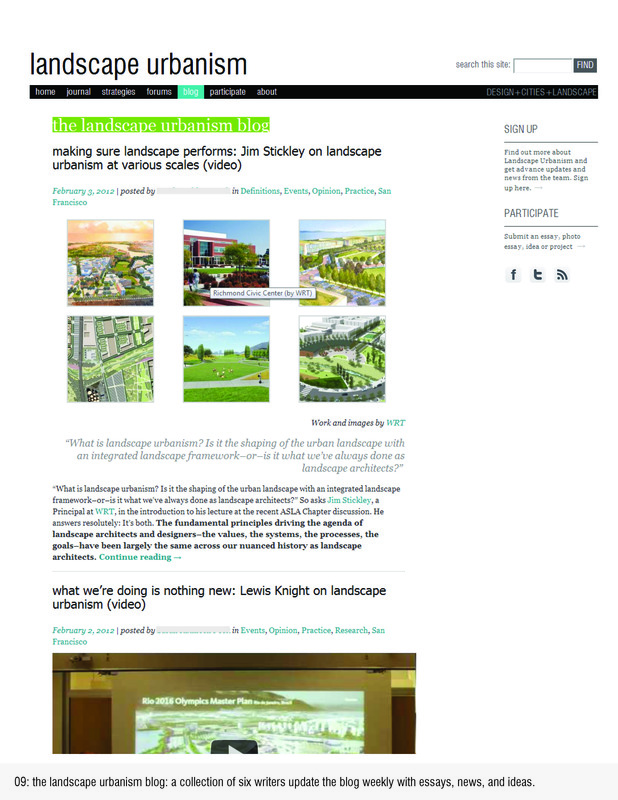 In the news, the founder of the website initiated a panel discussion on landscape urbanism at SPUR, San Francisco’s Planning and Urban Research Association in October; and in January moderated a second panel discussion on landscape urbanism at an ASLA chapter meeting. 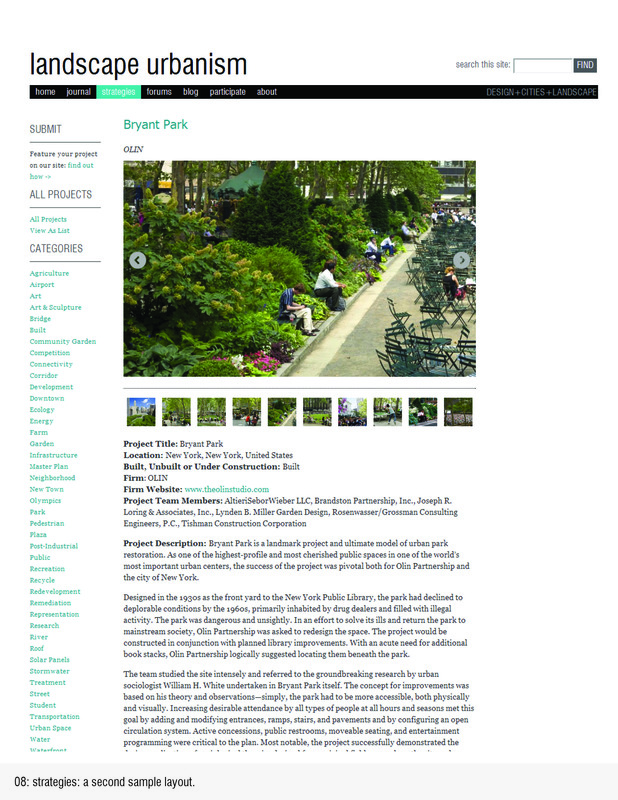 In December, SPUR profiled the site in The Urbanist; the website is reviewed in the current issue of the journal ‘Scape; an online interview with Fast Company is upcoming; and numerous blogs including Landscape + Urbanism and Topophilia have cited and talked about the site. We want to reach designers interested in the built environment — architects, planners, urban designers and landscape architects. We also want to bring the conversation to policy makers, developers, city officials, academics, theorists and economists — people who influence the design and shape of our cities. Lastly, we want to reach the everyday city dweller so that she can learn more about the places she lives in and visits. Landscape urbanism is not a prescriptive tool. We live in a complex world with complex situations — and there are not pre-determined answers for how to address its challenges. We are still figuring this out and the website provides a needed platform and forum for this evolution and exchange. We are researching, discussing and disseminating information and sharing why our work has relevance. 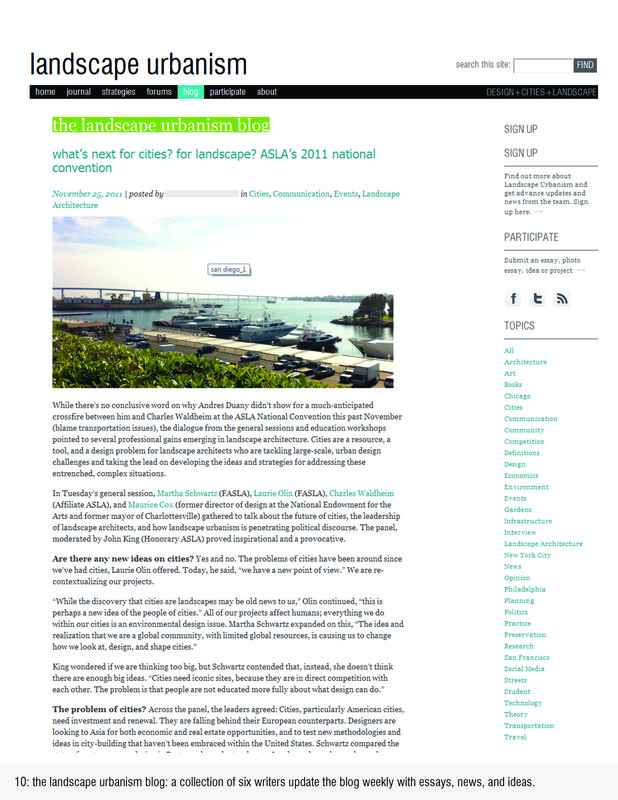 We’ve made a space — online — to expand the reach of landscape architects and landscape architecture.